When I say “the Christmas story” what do you think of? Maybe the awful lamp that looks like a leg with fishnet stockings. Maybe you think about the boy getting his tongue stuck on the flag pole. 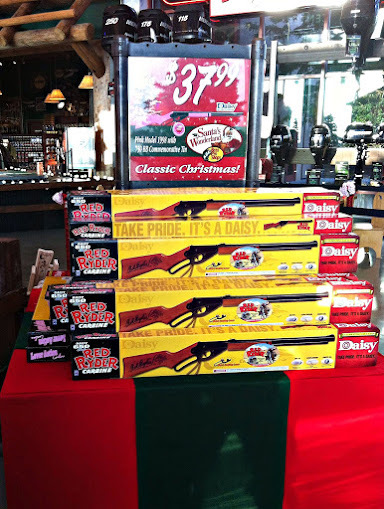 For me I always think about little Ralphie and how bad he wanted a Red Ryder BB Gun! His determination and seriousness of the whole situation always makes me laugh! This week we had an experience a very similar to The Christmas Story and it made my heart smile! 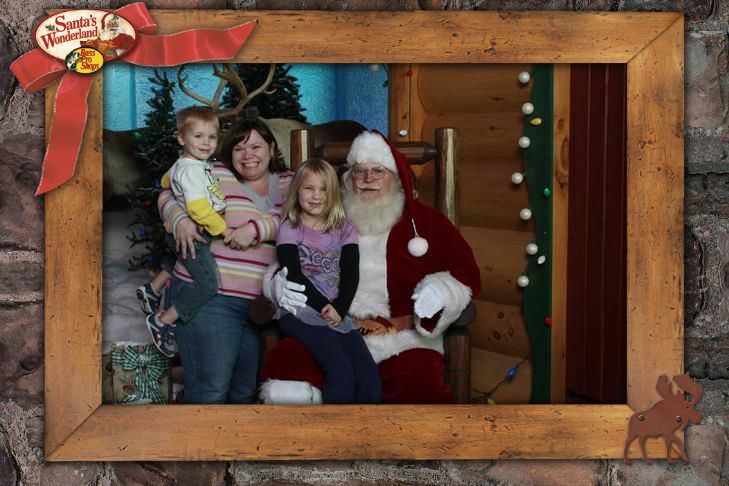 I found out this week that Santa’s Wonderland at Bass Pro Shops was open and ready for us at Bass Pro Shops! Growing up with hunters I am no stranger to that store. It is a hunter or outdoor lovers paradise! I have never taken the kids so I knew that taking them there AND experiencing the Santa’s Wonderland would be something they would never forget. It was perfect timing because I really wanted to get my husband (who is just a big kid) something special. All year I’ve been thinking about what the perfect gift for him would be. This week as I was thinking back on The Christmas Story it hit me! I should get him a Daisy Red Ryder BB Gun ! It is any boys dream and I know he would be just like a little kid again if I put one of those fabulous B B Guns in his hands! I saw online that Bass Pro Shops carries the Daisy Red Ryder BB Gun and so this trip to the Wonderland could not be more perfect! I loaded up the kids and off we went. The kids were in awe of the store from half a mile away at the size of the store. When we entered the store I thought they would faint. The stuffed wildlife, water fall, trees and out door toys were more than they could handle. At that point they though it could not possibly get better but they were wrong. After taking a tour of the store we found Santa’s Wonderland! This was truly a wonderland! It was full of hands on games that my kids loved! 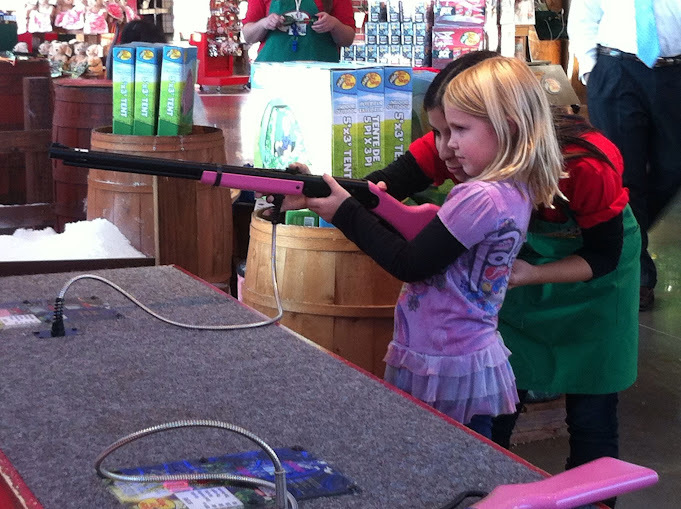 My daughter learned about shooting a Pink BB Gun (It was not shooting actual BBs). 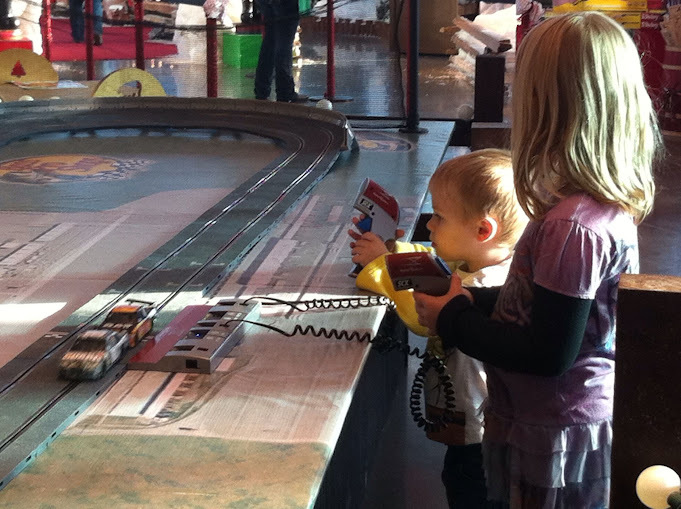 My son was in love with the giant monster truck and race cars. Then I looked up and was taken back to the movie. Do you recall the long walk to Santa that Ralphie took and how it was kind of spooky? Well the same was true of this set up. Now I LOVE Santa! I have always believed and will never stop so I was super excited to talk to him. The kids were actually a little spooked at first and I think it was the set up like I had noticed. But in his usual Santa style he immediately brought smiles to the kids faces when they reached his chair. He was just as jolly as always and didn’t look a day older than last year. My son was not comfortable sitting on his lap so he talked from my arms. My daughter sat right down and started going down her Christmas list. Unlike Ralphie her list had a lot more than one item on it. Right now they are giving everyone who visits Santa will get a FREE photo! I highly recommend everyone checking the Bass Pro Shops near you for times and events. There is so much free entertainment. We could have spent hours there. Once the fabulous moments with Santa had come to an end and I pulled the kids away from the games it was time to shop. I headed to the gun section up stairs to find the Daisy Red Ryder BB Gun I had in mind. It was not hard to find and the kids were just as excited as I was looking at all the guns. You can see our whole trip here for lots of laughs! 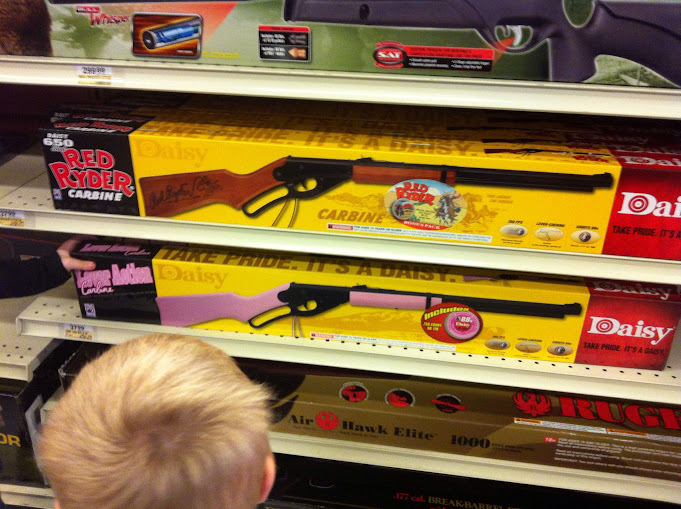 My daughter tried very hard to convince me that Daddy would like the pink gun, but I knew better. Seeing her excitement I am fairly certain we will have a girl BB gun lover in our future and I will be back to buy her that Pink Carbine . But for this trip she was too young and it was about her Daddy. The Daisy Red Ryder BB Gun was perfect. It was exactly what my “big kid” would love! I had no idea that it was so affordable or I would have done this sooner. As the careful mom and bossy wife I am I read all the cautions on the box and got the items it listed. You can see more on gun safety here. Safety glasses are a must! In my head I kept hearing Ralphie’s mom saying “You’ll shoot your eye out!” I found the perfect glasses and then searched for some fun targets. We have an open area behind our house with nothing but trees and a creek that is perfect for shooting his gun but I knew he would need something to aim at. As we pulled in the drive I told my kids not to tell Daddy about the gun because it would be a Christmas present. Well that did not go well. I live with the most impatient people in the world. So between my husband asking questions and my kids about to bust with excitement I knew it would not wait until Christmas morning. So I wrapped it in a blanket and brought it in. I decided it would be an early Christmas gift. The reaction was all that I hoped it would be. It was actually better! He decided to skip dinner and go outside to try it out immediately! He was exactly like a kid on Christmas morning! His eyes were glowing and I could tell he wanted to jump up and down. So outside we went. 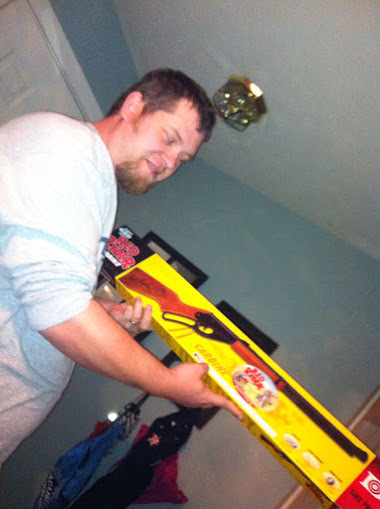 He said with pride “I have a Daisy Red Ryder!” I was one happy wife! Enter this giveaway using the rafflecopter form below. Giveaway ends 11/24/12 at midnight. One winner will be chosen via random.org through rafflecopter The winner will be notified via email and announced here. Please keep in mine Daisy’s recommendation that this only be used by those 10 and up.